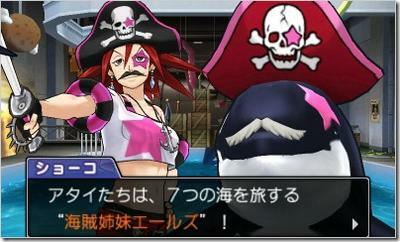 Remember that Mature rating Phoenix Wright: Ace Attorney Dual Destinies landed itself? Gruesome murders, horrible conspiracies, passionate crimes. It seems obvious in retrospect that the series always might have needed an M rating, and then something like this has to come along and remind us how goofy the series really is. The first DLC package retells the case which marks Phoenix Wright's return to the legal scene. Those expecting a grandiose tale of the worse kind will do good to look elsewhere because his first client is not exactly human. Yes, the legendary self-deprecating defense lawyer makes his grand re-entrance by defending an orca accused of murder. It's quite obvious because no other serious practicing attorney would be taking this case from a pirate costumed trainer. How or why an orca has been charged with murder remains a mystery, but anything is possible in the legal world of Phoenix Wright. I wouldn't put it past the team to make it compelling somehow. Consider my purchases of Phoenix Wright DLC as 100%. There are few better written Japanese series out there. Capcom has confirmed the release of the DLC packages in both America and Japan, and this first one will be titled Turnabout Return. It will also come with an alternative costume pack for Phoenix Wright, Apollo Justice, and their bubbly new sidekick Athena. Phoenix Wright: Ace Attorney – Dual Destinies will be a download only release for the Nintendo 3DS sometime in Q3/Q4 this year.